Flags of War: Death of Douglas Vginette Give away!!! Death of Douglas Vginette Give away!!! I have had this beauty for sometime now and after i posted a thank you to David on my personal blog (http://thecamlachiewolfe.blogspot.co.uk/) i felt it was about time i gave it away as planned. The vignette depicts the death of Douglas at the battle of Otterburn. The story goes that the Douglas told them to make sure his death wasn't known to the rest of his army. With this order his colours were hoisted high with chants of "Douglas....Douglas.....Douglas" and the Scots went onto win the battle. The pictures don't do full justice to it and i only wish i could keep it. I asked David with the help of Andrew Taylor to paint me this just before Christmas and had planned to give it away in Feb but just hadn't got round to it. To be in with a chance of getting this giveaway, any order over £5 excluding delivery between 29/04/12 and 31/05/13 will be entered into the draw. 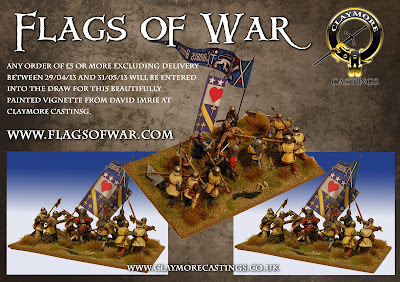 I felt this the best way to do as to get such an item would cost a fair amount to be painted by two of the best painters in the Wargames scene. Have you started on any of the Battle of Tewkesbury banners or standards (other then the one's that are suitable for Otterburn)?